If you wonder why the inner part of the Ranger blade is not sharpened? The inner part is not sharp because it functions like a stopper for the blade. This part stops against the notch on the spring to protect the edge from impact with the spring. It is a stopper function. 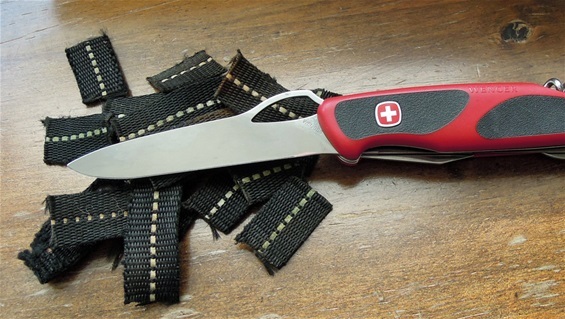 When the blade is closed the lock-release has no function but it can move freely without damage from the edge. 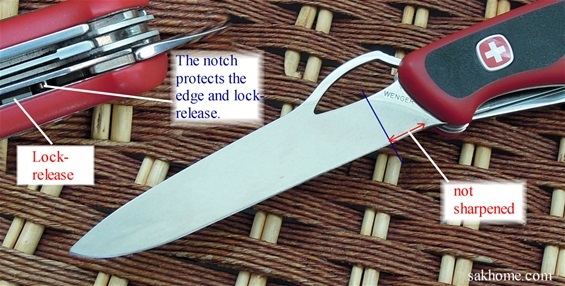 The notch functions as a rest for the blade. It is also normal on SAKs to use notches on a spring to function as stabilization. By this is mean from twisting motions and more. I would believe this notch serves different functions for the assembly and construction of the knife. The big flat screwdriver with the push lock mechanism. It is very easy to operate and it works very well. I can mention that sometimes this functions needs to wear in or you need to have some oil on it if it is dry. It can happen that when it is pushed in that it will not automatically slide out again. One need to pull it out before it can be closed into the body of the knife. This can happen because of the very fine precision and it can also be because it needs cleaning. 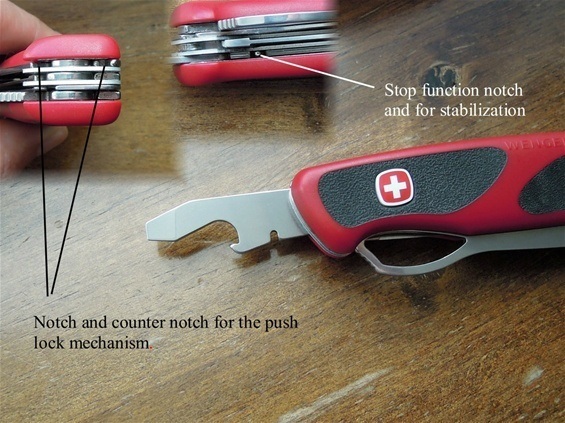 On the spring you can see the notch and this is a stop or rest for the flat screwdriver. It is to me also rather obvious that this notch functions as stabilization for the spring during twisting motions. 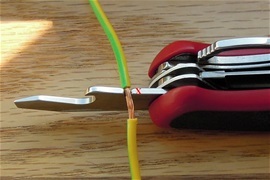 The cable stripper or bender is independent from the notch in the spring. The notch rest at x.